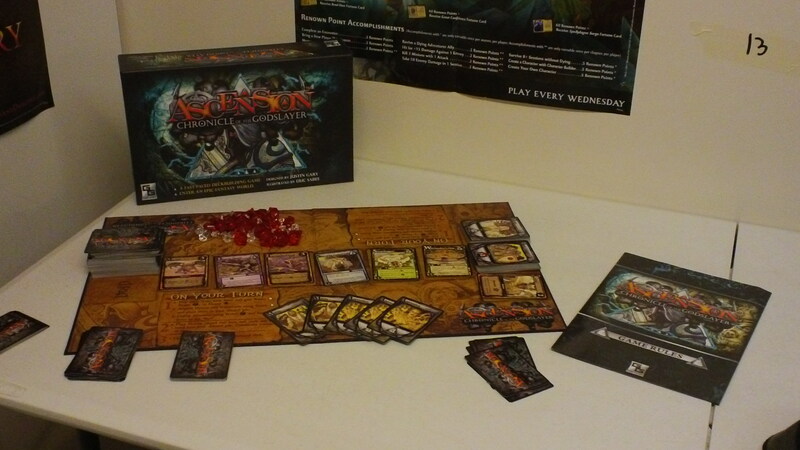 Ascension: Chronicle of the Godslayer by Gary Games. Accessibility: The game is very easy to learn. Once you get past the bizarre nature of building as you play, the game just sort comes to you very easily. You have resources and you use them. None of my group had a problem learning it. Can play with 2 to 4 players (up to 6 with the expansion I’ve yet to buy) but it’s definitely more fun with more people. Pacing: Being a card game, the pacing can be very random here. It’s slow to start but gets faster as you gain and use bigger and better cards. However, sometimes you get a center row (where you get all the cards you get for your deck) that’s all monsters or high cost cards and it just drags on until someone gets just the right hand. They curbed this somewhat by including three cards, two heroes and a monster, that you always have the option of getting but it’s still disheartening to look at the center row and think ‘I can do nothing with any of that’. Presentation: All of the art was done by one person. Overall, the card art is pretty good, some of it is way better than others. The box looks good and enticing on a shelf but is way bigger than what is needed for the game. Overall, you tell that a lot of thought and work was put into this game. Fun: This game is very fun. I’ve never played a game that wasn’t fun. There’s a strong screw your neighbor element when you’re playing with a group that can drive the game. Final Thoughts: The only problem we’ve had with this game is the end. You play until you run out of a pool of honor. Sometimes, people get an additional turn after this pool is depleted, turns where they can still gain honor. I’m not sure if I misread something, but there was no way to continue tracking honor after that. We house ruled so you could. Also, the game is hard to find. I had to have my copy special ordered. Rating this game, I’d give it a 4 ½ out of 5.